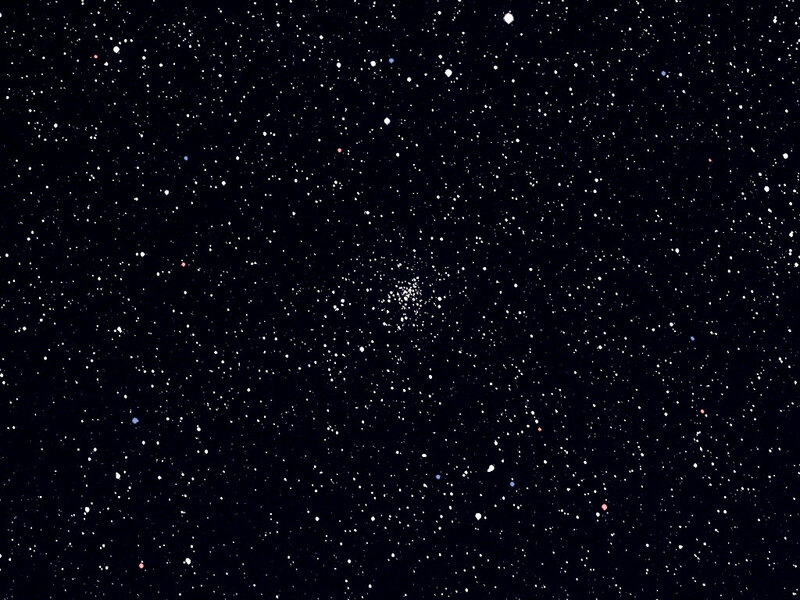 The Globular Cluster M71 was formerly classified as an Open Cluster. It is now believed to be a “Loose Globular.” It is 13,000 Light Years from Earth. FSQ-106ED, STL-11000M, Luminosity only, with background colored deep blue, and a couple of stars colored, in Photoshop. A brief spell of partially clear weather on June 23, 2009: Albireo, aka Beta Cygni (Constellation Cygnus). 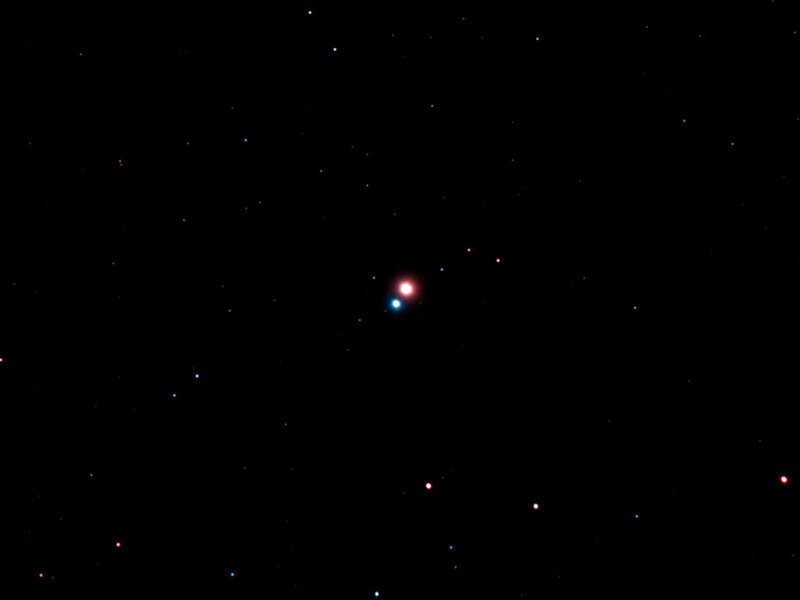 Albireo is a favorite among observers and astrophotographers alike due to the distinct contrast in color between the two stars. The brighter star usually looks to me to be a golden-yellow color visually, but my modified Canon 40D rendered it more reddish. It is the nature of computer-processed digital photographs that anything can be any color the photographer wants to make it. Here I tried to leave the stars pretty much the same color as the camera recorded them, adding only a bit of contrast to make them stand out. Tak FSQ-106 ED with 1.6x Extender Q. Another bit of clear weather on the night of 3-4 July, 2009, let me capture this planetary nebula. 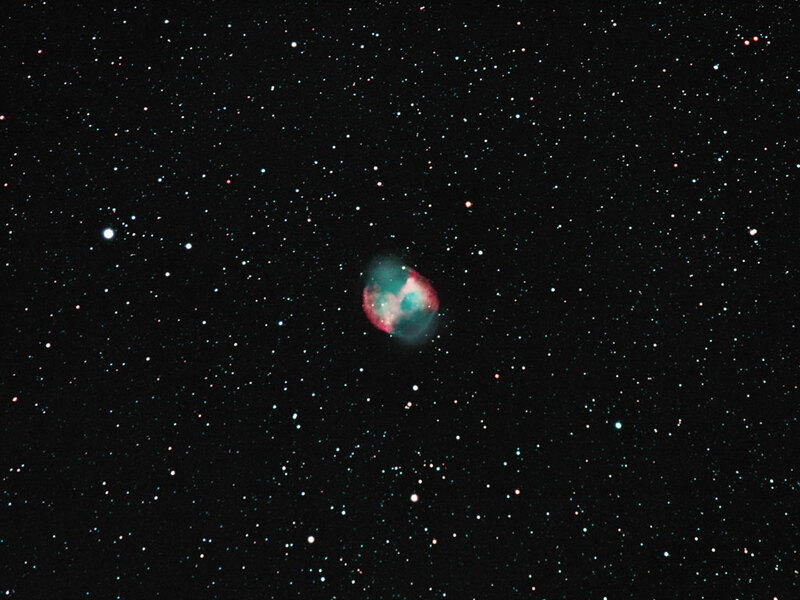 I was not the first, however; M27 is relatively bright and has long been a favorite target for visual observers with small telescopes. Nine five-minute exposures. FSQ-106ED with Extender Q (1.6), Modified Canon 40D. The name "planetary nebula" is an unfortunate misnomer, as planetary nebulae have nothing to do with planets. It is said that an early astronomer viewed one through a telescope and thought it looked like, or perhaps mistook it for, a planet. That seems unlikely, since the planetary nebulae that I have seen do not, resemble planets even remotely. But we’re stuck with the name. When we look at a planetary nebula such as M27 or the very familiar M57 (next Deep-Sky page) we are looking at the future of our own Sun. A planetary nebula is created when a star like our Sun, which is not massive enough to die a spectacular death in a supernova explosion, enters its red giant stage. It casts off its outer layers of gas while radiation from the star excites the atoms in the gas and causes them to emit light. The color of the light depends on the gases that are illuminated. Red signals hydrogen and green signals oxygen.